One hundred thousand square meters. TGW and SAP Logistik specialists worked on an area that big, modifying the functioning of the Conrad logistics center. The main focus was automation. That’s no surprise at all, there are several hundred thousand assortment items to handle. The company, which is almost a hundred years old, currently operates on the market for multi-channel distribution of this type of products. It has online stores in many countries and addresses separate catalogs to particular groups of clients. The list of products is enormous. It contains about 700,000 items, from the smallest electronic components of equipment for buildings to measurement techniques products, as well as gadgets from the world of electronics, computers and communication technologies. 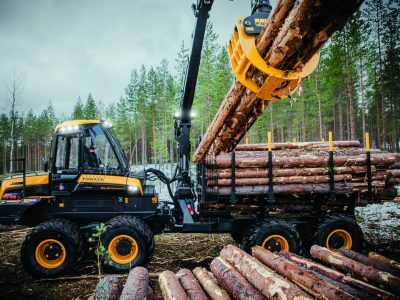 The tasks set by the heads of the company were clear: increase the storage space, its capacity, increase efficiency, as well as improve the cooperation of the warehouse management system with the SAP platform and the material flow control system. 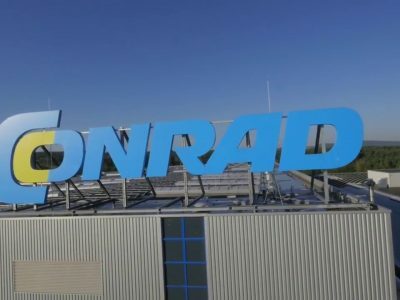 Conrad handles its logistics from one distribution center located in southern Germany, from which it delivers goods both to stores and to online customers. 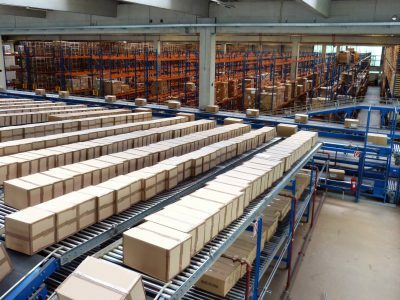 For typical operations in the electronics distribution industry, it is very important to have not only an efficient and reliable shipment completion process, but also automatic forecasting and calculation tools related to the selection of shipping boxes, order consolidation, the packaging process itself, as well as handling returns (which can applies up to more than ten percent of shipments). Before launching a thoroughly modernized distribution center, about 35,000 packages were sent daily to 150 countries. Conrad decided to build a new shuttle type warehouse, without additional IT systems, only based on SAP EWM Material Flow. Logistics and automation specialists were involved in the task. The goal was ambitious, for example to increase the number of parcels sent up to 100,000 per day, as well as to be able to deliver to the customer within 24 hours. The solution is based on a shuttle type warehouse with over 200,000 locations and capacity of 12 thousand double cycles (12,000 containers entering and leaving) per hour, being the center of the entire logistics system. The transport is based on STINGRAY trucks. How does it work? When the goods arrive at the warehouse, they start their journey through logistics stations. From the goods reception area, products are transported to 36 re-packing stations, where the goods go to appropriate containers to ensure safe transport throughout the system. These containers are then transported to the TGW STINGRAY shuttle, where 375 trucks handle three completion levels (each equipped with 15 completion stations). All shuttle trucks are controlled by SAP EWM/MFC. They operate according to the „goods-to-human” principle, are supplied with goods in accordance with a defined sequence, so that several orders can be completed at the same time. After the completion, the goods are transported to the control station (equipped with a scale and video camera system). The control system verifies the quality, current weight and barcode of the order. This process takes place at 21 control stations. Ultimately, the cartons are closed and labeled (this is done simultaneously). In the case of special promotions for goods, a different zone is activated – the completion of individual lines. Goods that have not been taken from the containers are returned to the warehouse, constituting a storage buffer. Sometimes we have special promotions in our offer, which are then ordered in a very large number, such as memory cards or headphones. Then we transfer such orders to the individual line completion stations. We also activate these stations during the peak season – says Udo Hermannstädter, director of logistics of the company. 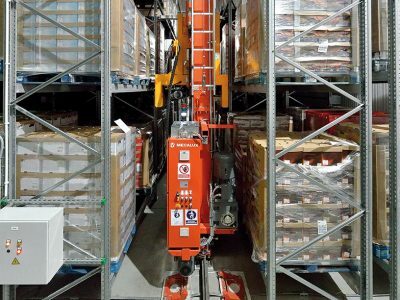 The TGW Natrix sorter separates the ordering cartons into individual routes, from there they will be transported by a telescopic conveyor to trucks. The new system has a capacity of 6,000 packages per hour. In our distribution center, two-thirds of activities serve online sales and one third is focused on supplying our stores. That is why 30 stations are dedicated to service online orders, and 15 stations support stores. We wanted to use the entire warehouse space, which is why we opted for completion on three levels” – says Udo Hermannstädter.